Hi.. Thanks for the code.. Assume that My hard disk’s C drive crashed due to virus and I can’t able to retrieve any past datas.. So, I’ll format the disk and will create a new database which will accept only .txt format..
My question is,Is it possible to create Ami database which will accept both .csv and .txt format..? Since, our backup is in .csv format I raised this Question..
Yeh Govindharaj… It supports both .txt and .csv format… you just simply edit the afl code and change it to ur required format and get the backup…. Hi.. I just replaced .csv with .txt in the first line of the code and got backup in .txt format.. Sorry for the previous post.. But, how to use these datas in a new Database..? Can this be used for IEOD? While i am trying to take backup the database in amibroker using the above afl it shows an syntax error as below..
website sometimes creates Double quotation problem. Yeh spot out the problem. Now it is corrected. Hi, Still the same syntax error appears, pls help. still not working any solution to save data in amibroker ???? solved the problem of syntax error..
Nice utility. One query where does it store the csv file? I am having a bit of a problem with this code. Firstly, I was trying to export intraday data. So I removed the comments to include time. I am afraid the data is coming in one continuous line and there are no line breaks. The time is also not coming correctly they are all coming as 00:00:00. When I see the data in the quote editor and of course in Ami the data is displayed correctly as bars. My final code is pasted below for ready reference. I figured out the issue… Guess, the line feeds are missing.. Thats the reason for the data coming continuous. As regards the time stamp issue, it needs to be set in the settings to one minute and then it comes out just fine. 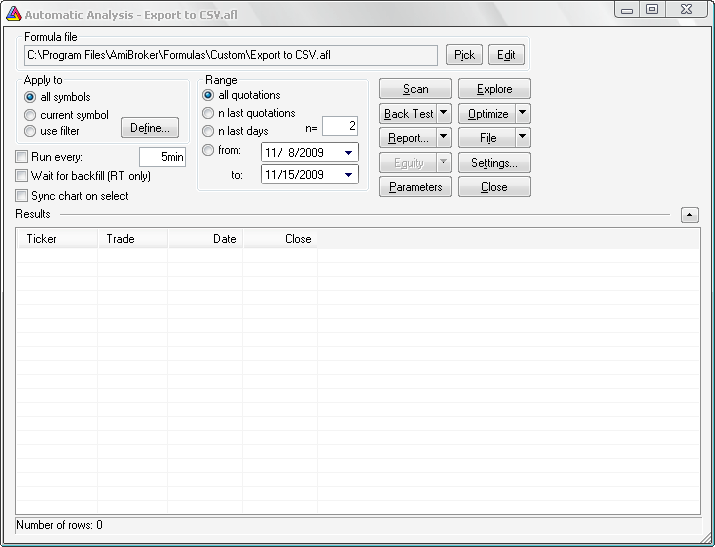 is there any update of the afl for exporting the explorer data to excel/csv…?